The QLZH Group has been named ‘National Winner’ in the 2017-18 European Business Awards, Europe’s largest business competition, sponsored by RSM. The QLZH Group was chosen from 2,898 businesses (28 from Malta) previously identified as ‘Ones to Watch’ in a list of business excellence published in December. 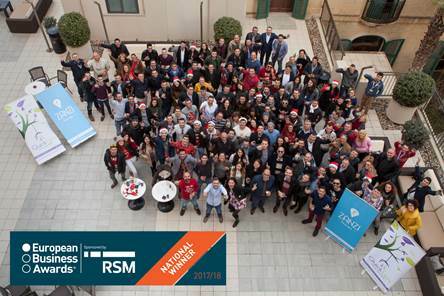 The Group was selected as a National Winner by a panel of independent judges including senior business leaders, politicians and academics as the best business in Malta in the Awards’ category Entrepreneur of the Year. The Group will now go on to represent Malta in the final stage of the competition in Warsaw, Poland. The European Business Awards considered over 110,000 businesses from 34 countries. The QLZH Group was founded five years ago and today delivers Real Estate services form 23 branches with a team of over 275. Group founder and CEO Steve Mercieca says “Our clients’ satisfaction is the highest award we can ever wish for but a recognition by independent European judges gives us the confidence we are on plan with the ambitious goals we set ourselves. I would like to publicly thank all our team members, business partners, family and friends who supported us from day one. We are all very excited to represent our country and promote our economy overseas”. The QLZH Group will head to Warsaw on 22 and 23 May to complete a final round of judging and attend both a Summit to engage in business issues and the Gala Ceremony where the overall category winners for 2017/18 European Business Awards sponsored by RSM will be announced. Separately, the Group is also competing in a public vote to be named ‘European Public Winner’ at the Gala Final. The public vote engages with people from across the globe and last year generated almost 250,000 votes. To view the QLZH entry video and vote please go to: www.businessawardseurope.com. “We urge the Maltese public to support us by voting for our video at the link above. Apart from promoting our company, the main goal of this entry is to raise awareness of the work being done by our QLZH Foundation”, Steve Mercieca adds.